Boryslav Mykolayovych Brondukov (Ukrainian: Борислáв Миколáйович Брондукóв; Russian: Борислав Николаевич Брондуков; 1 March 1938 – 10 March 2004) was a Soviet and Ukrainian film character actor, People's Artist of Ukraine. He was born in the village of Dubova somewhere in Kiev oblast of Ukrainian SSR in a Russian-Polish family. After graduating a construction vocational school he started to work at the Kiev Arsenal factory which after World War II was once again established in the city. At this time Brondukov began to perform in theater as well. His work was seen by the rector of Karpenko-Karyi Institute of Theatrical Arts in Kiev and at an age of 23 Borislav became a student there. Since 1965 Brondukov has been an actor of the Dovzhenko Film Studios (Kiev), though he has worked at many other film studios in the Soviet Union as well. 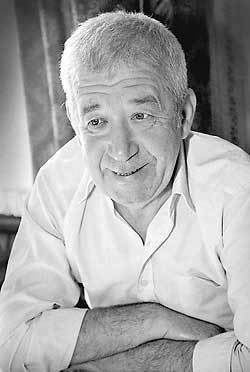 Brondukov became a People's Artist of the Ukrainian SSR (1988) and the first winner of the Alexander Dovzhenko Ukrainian State Prize (1995). He was featured in over 100 movies among which are Zakhar Berkut, Vavilon with Mykolaychuk, Mimino, the role of Inspector Lestrade in The Hound of the Baskervilles and other Holmes TV series directed by Igor Maslennikov, and others.